A large travertine patio surface is just the beginning of this project. The patio is bordered by stone seat walls with low-voltage lighting on the inside face. 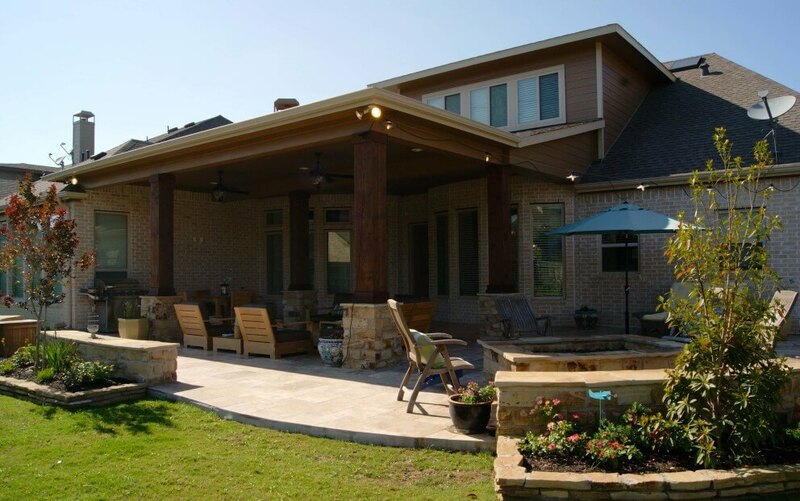 There was an existing small covered area which was expanded and the columns were rebuilt to look like columns on the front porch of the home with stone bases and cedar finishes. The uncovered portion of the patio contains a large gas fire pit filled with lava rock. Another view of the project from behind the firepit. The ceiling is hardiepanel painted brown to blend well with the stained cedar. Great furniture adds to the enjoyment of this open porch.